Hashim Amla has been backed to rediscover his appetite for big runs ahead of the World Cup following a dip in his white-ball form. 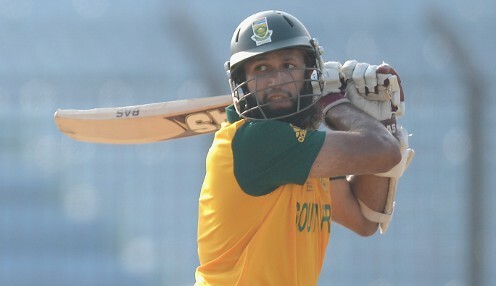 Amla, the most prolific one-day centurion in South Africa's history with 27 in 50-over internationals, has struggled for Cape Cobras at the start of the domestic Twenty20 franchise competition, managing scores of two and 16 in the opening two matches. The 36-year-old contributed just 10 in his single Momentum Cup appearance for the Cobras last month. But Cobras assistant coach Faiek Davids has no doubt that the prolific batsman will return to something like his best before heading to England with the Proteas. "Hashim has obviously been on a bad run of form, but he is a quality player," Davids said. "If he's available to play then we're happy to have him in the team. He is a massively experienced player and has a wealth of runs behind his name. "We know he's just one knock away from getting it right, so we back him and are quite happy to have him here." Amla has a batting average of 49.74 in one-day internationals, the sixth highest amongst those to have made 100 or more appearances. South Africa are 9/1 to win the 2019 World Cup.